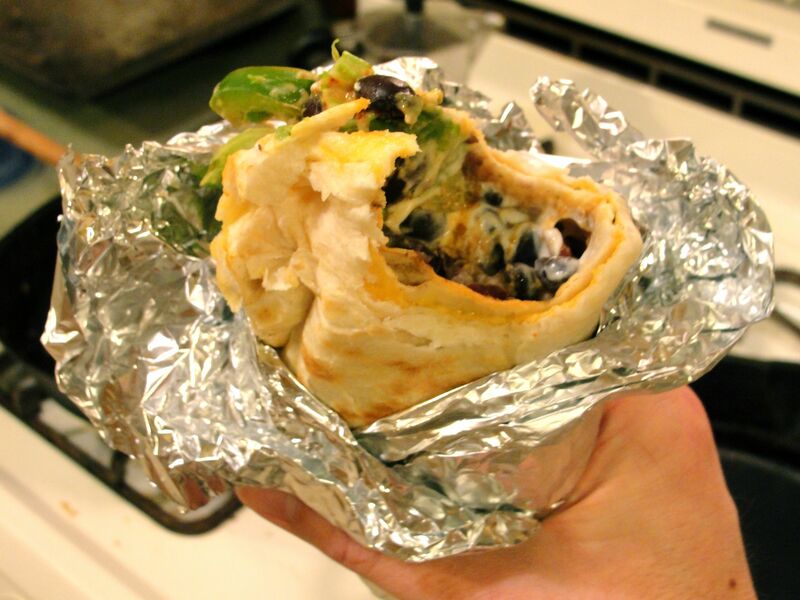 Blog Anniversary Excess: the Quesarito! WordPress just wished me happy anniversary… I’ve been blogging here for about a year. For no particular reason, I’m celebrating with this possible abomination: the quesarito – a humongous burrito made with a quesadilla. Apparently, this was invented, or likely reinvented, by a Chipotle Mexican Grill customer; I wouldn’t be surprised if it was conceived drunkenly. 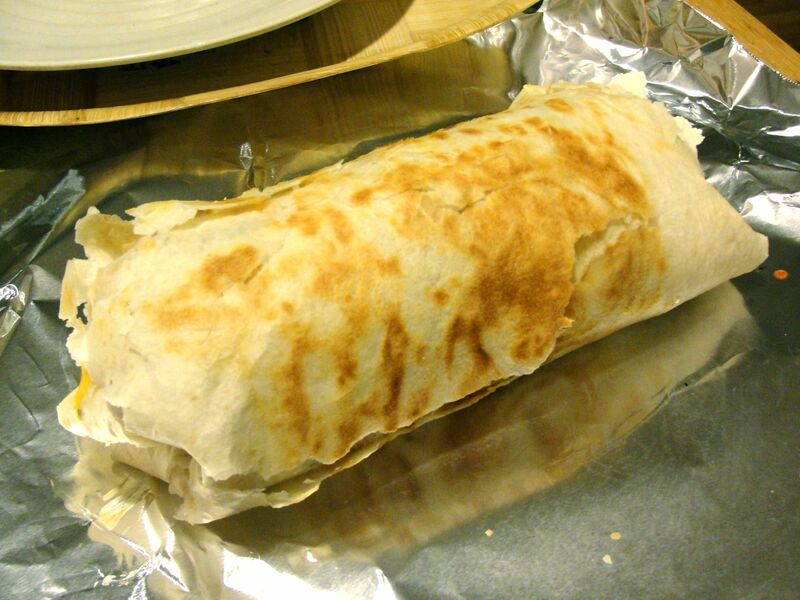 It has achieved an underground following with accompanying rumors of its legitimacy, as was pointed out last week by a friend who posted this article: “The Mystery Behind Chipotle’s Secret 1,500-calorie Super Burrito“. Anyway, I’m not a regular customer, so I thought, “Why not just make this at home?” I’m pretty sure that my vegetarian version is trimmed down from their 1,500 calories, but perhaps not by much. 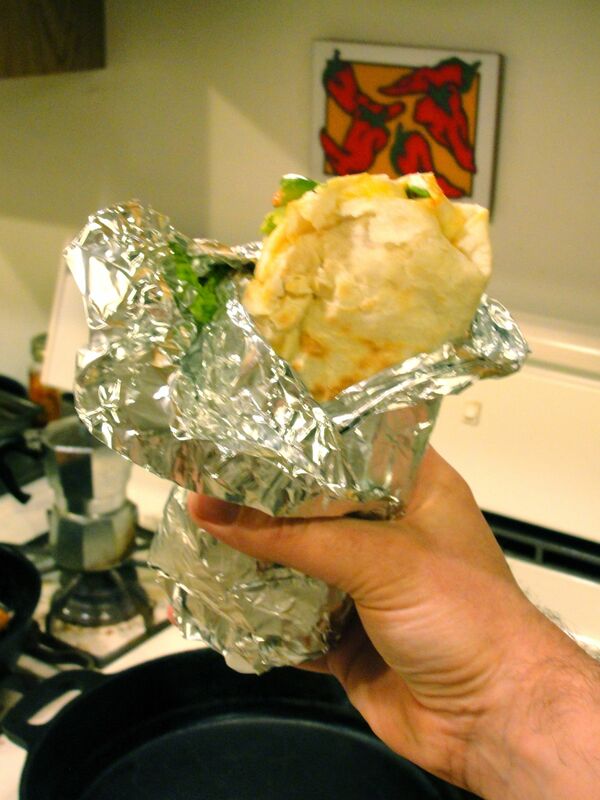 The two 10-inch tortillas, alone, contribute 180 calories each, yet these are smaller than what Chipotle uses. To start, I sautéed green pepper, red pepper, and red onion pieces in a bit of oil. 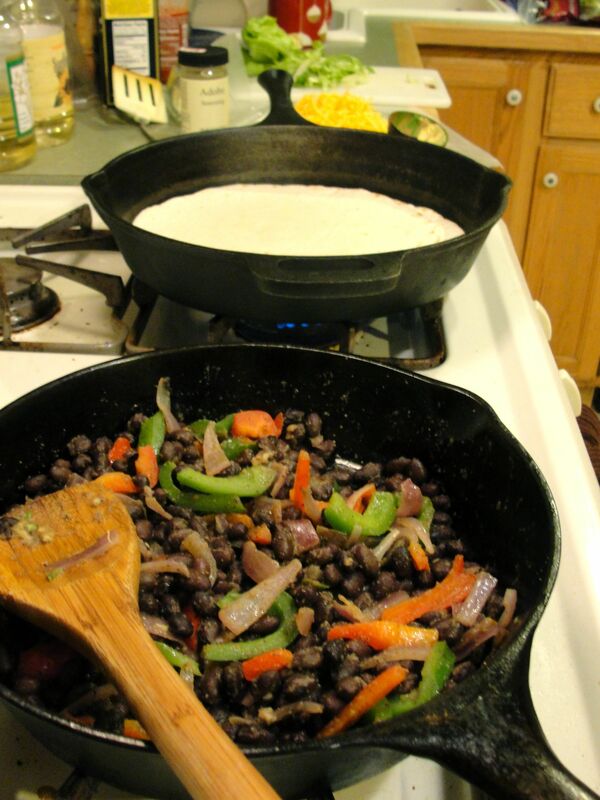 Then I added a can of rinsed black beans, and stirred in a couple teaspoons of adobo seasoning and a touch of salt. The amount shown here is plenty for two burritos. Meanwhile, I made a simple “double” quesadilla from two large flour tortillas, shredded sharp cheddar cheese, and dried cilantro leaf. I say “double,” because I typically make a quesadilla with just one tortilla, folded in half over the fillings. 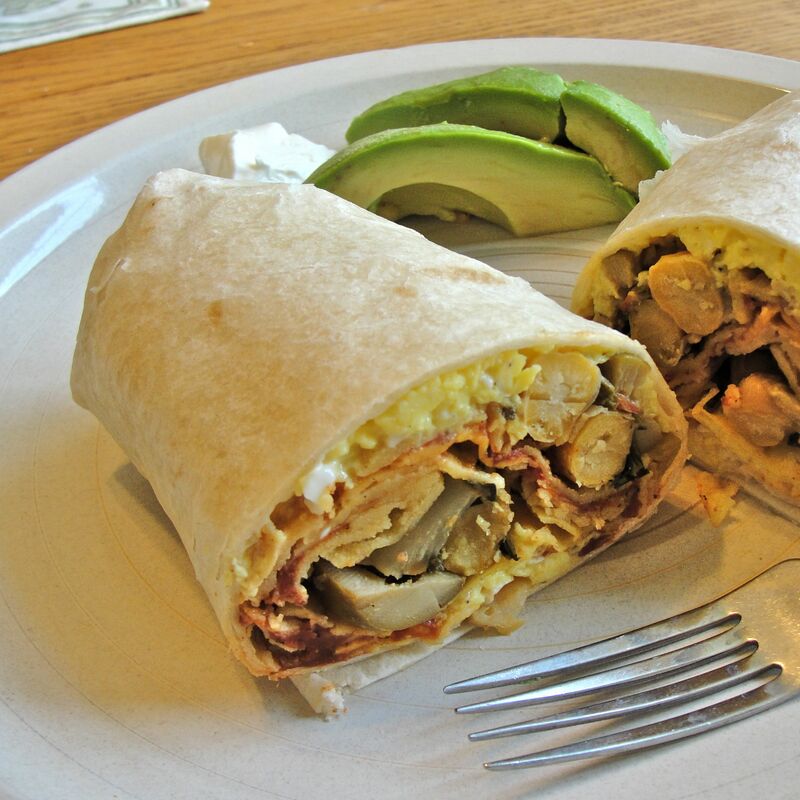 Be sure not to make it too crispy, so that it won’t crack when wrapping the burrito. 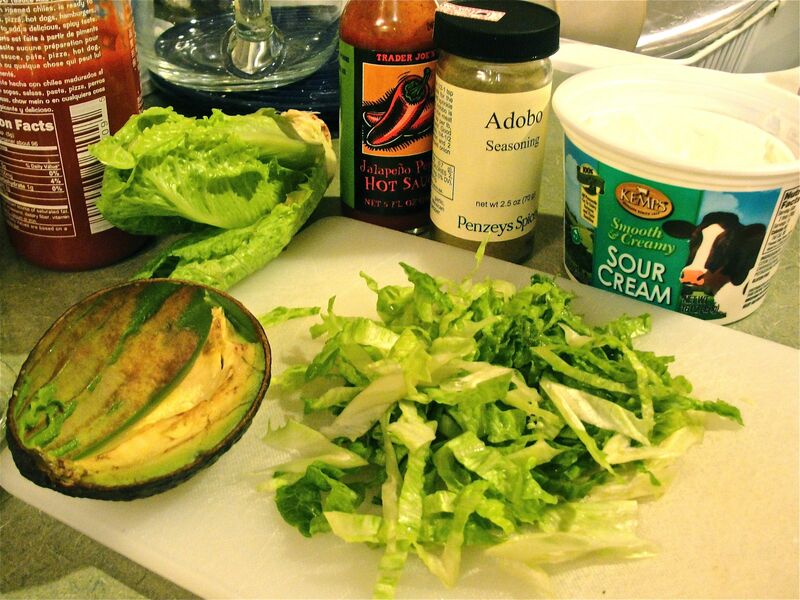 Additional ingredients included: finely sliced romaine lettuce, ripe avocado, sour cream, Penzey’s Adobo seasoning, and Trader Joe’s awesome Jalapeno Pepper Hot Sauce. 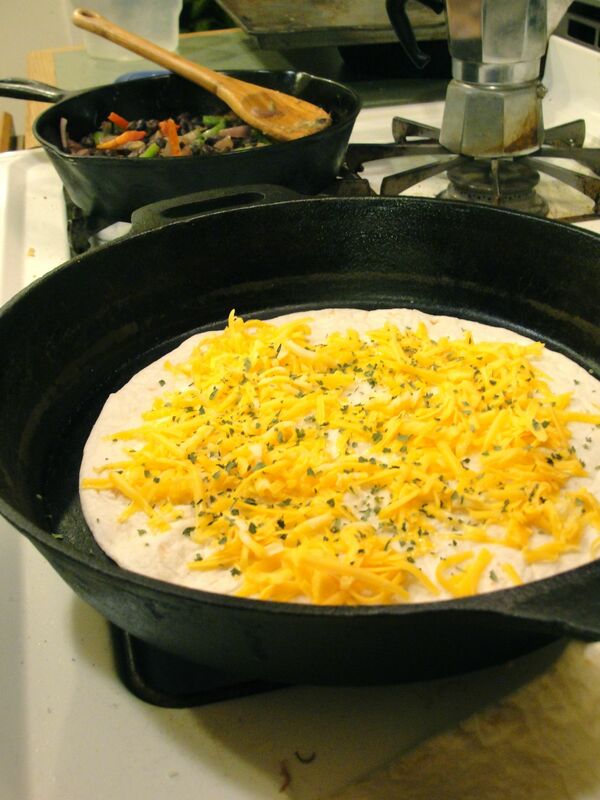 Once the quesadilla was ready, the filling ingredients are piled on. Because this wrapping tests the structural limits of the tortillas, I also wrapped it in foil, just like, umm, the finest restaurants do. That’s it: if you followed along, you’ve probably just made something you should be ashamed of, unless it’s your meal for the whole day. P.S. If you’re a fan of stuffing things inside other things, you might like my “walking enchilada” as well: an enchilada stuffed in a breakfast burrito. 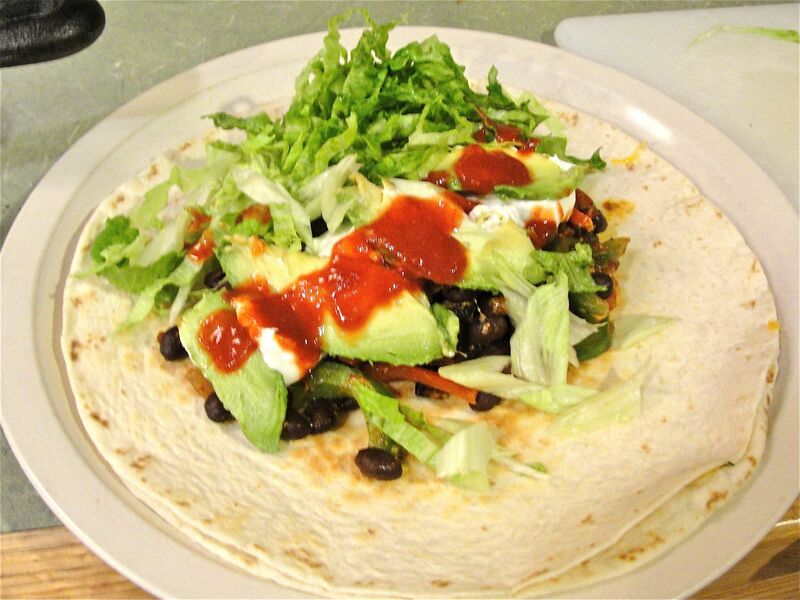 Perhaps next year, I’ll do a Tex-Mex turducken: an enchilada inside a burrito, inside a quesadilla… because that just totally makes sense. It should probably be reserved for one’s return to civilization after be lost in the wilderness, or a last meal on death row. Happy anniversary dear Dave! Just an astonishing way to celebrate! Thanks, Ribana – astonishing is probably the right word! Any reason to eat a humongous burrito s a good one. lol :) I’m sure the other way ’round would be great.